Campylobacter jejuni is a Gram-negative, spiral-shaped bacterium. C. jejuni is often found colonising the stomachs of poultry, where it very rarely causes any disease. This mutual relationship with poultry is one of the reasons C. jejuni is well adapted to causing disease in humans. Once the bacteria gets into the stomachs of humans (through eating uncooked chicken for example) it can cause a dangerous disease called gastroenteritis. Symptoms of gastroenteritis include bloody diarrhea, vomiting and nausea, and without proper treatment can eventually lead to death particularly in the developing world. If left unchecked, gastroenteritis caused by C.jejuni (campylobacterosis) can progress to the autoimmune disease Guilain-Barre syndrome (GBS). This is rare and only occurs in 1 out of 5000 cases of campylobacterosis. GBS is fatal in between 2-3% of cases, which adds up to a large number when you consider that tens of thousands of people contract campylobacterosis per year. One of the key features of C. jejuni that helps it to cause disease is its ability to move towards nutrients and away from things that may damage it. This 'Chemotactic motility' is due to a polar flagella, and is the focus of a lot of the research at the University of Leicester. In addition to chemotaxis, motility in C.jejuni is also controlled by a process called phase variation. Indeed, many other genes in C. jejuni are subject to phase variation, including those responsible for sticking to host molecules and taking up essential nutrients. 1.) 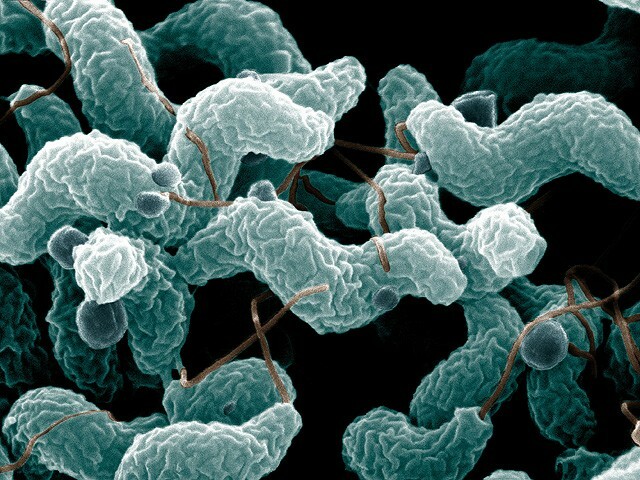 Campylobacter jejuni is the most common cause of food poisoning in the world. 2.) One of most important features that allows Campylobacter to cause disease is its motility. Scanning electron microscopy image of Campylobacter jejuni. In brown you can see the filamentous flagella. Colouring is false.